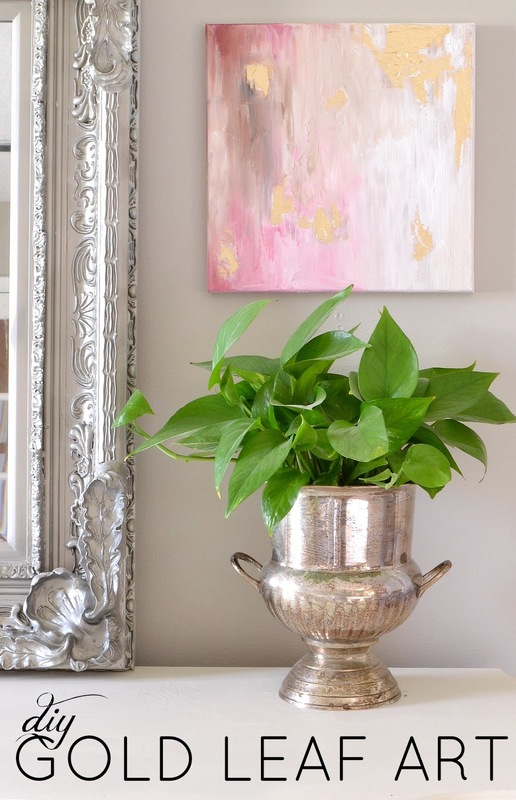 LiveLoveDIY: 50 Budget Decorating Tips You Should Know! 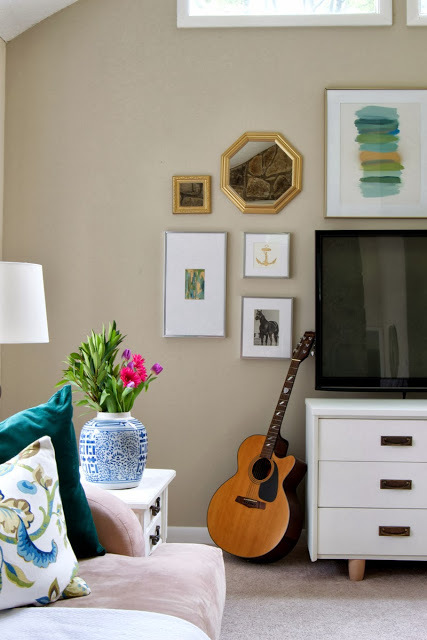 50 Budget Decorating Tips You Should Know! Hey ya'll. So, this renovation that I've been snailing my way through is finally on the home stretch. I've been painting and installing trim and doors for nearly 6 weeks now, and I think I might actually be finished by this time next week. 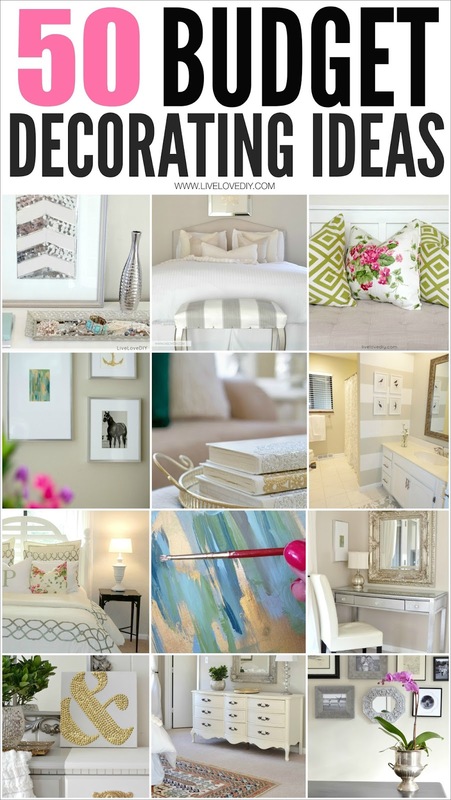 I'll be sharing all of the details about what I've been up to very soon, but in the meantime, I wanted to take a minute to recap some of the best budget decorating ideas that I've come up with in the past 2 years before we started the renovation. I'm not the best decorator. I look back on some of my creations and think 'No, Virginia. Just no.'. But, like anything, I've improved with time. And one of the most common questions I get from readers is about decorating, and specifically how to do it on a budget. So, I've narrowed the list down to my top 50, and I've even thrown in a few projects and ideas that have never made it onto the blog before, just for fun. Consider this one big last hoorah and a friendly little wave to my 1970's house that existed before the renovation. I mean, it will always be a 1970's house...it has a giant rock wall built through the center of it. But, you know what I mean....we're making progress. Let's get started! Here are some of my favorite ideas from the past 2 years. 1. I get asked all the time about how I keep clutter to such a minimum. 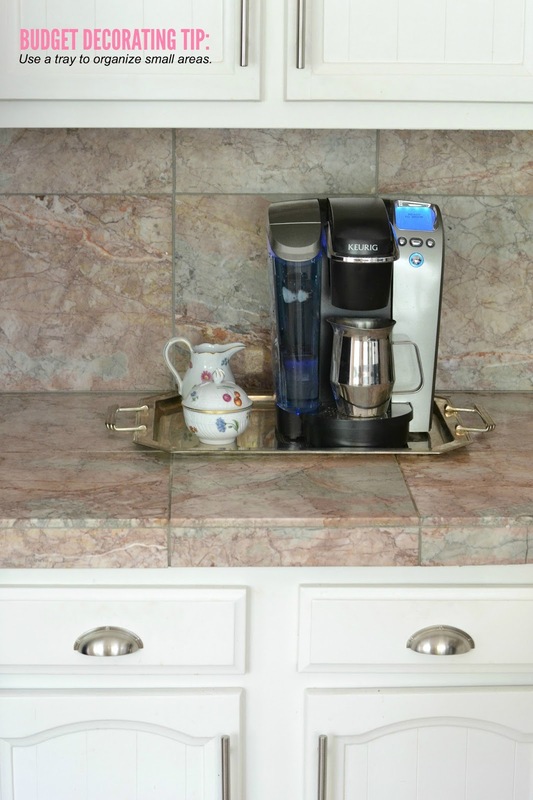 And one of the ways is by using trays to organize small spaces. For example, just this week I found a little silver tray at the thrift store for $1, and I created a little coffee station where I can keep sugar, spoons, etc. It's not rocket science, but it works and it's cute. 2. Use vintage finds in unconventional ways. I found this vintage champagne bucket for under $10 and use it as a planter. I've also seen these used for holding wooden utensils on the kitchen counter. 3. Have an off-center light fixture that's driving you crazy? Well, I have several in this house, and rather than paying an electrician to move the entire thing over, I just swagged it over with a chain and ceiling mounted hook. You can find specially made hooks in the lighting section of your hardware store. Update: For those of you who have been waiting on me to finally finish the dining room (after only a long 8 months), here it is. I'm so sorry I'm such a snail. 4. 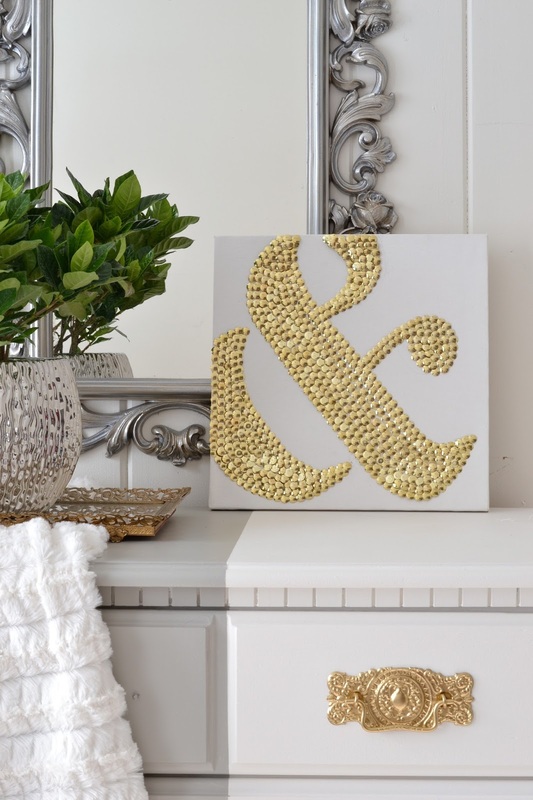 Make your own art with a blank white canvas and gold thumbtacks. Tons of you put your own spin on this project by using silver thumbtacks or making an initial...I love when you take something I've done and make it even better. 5. 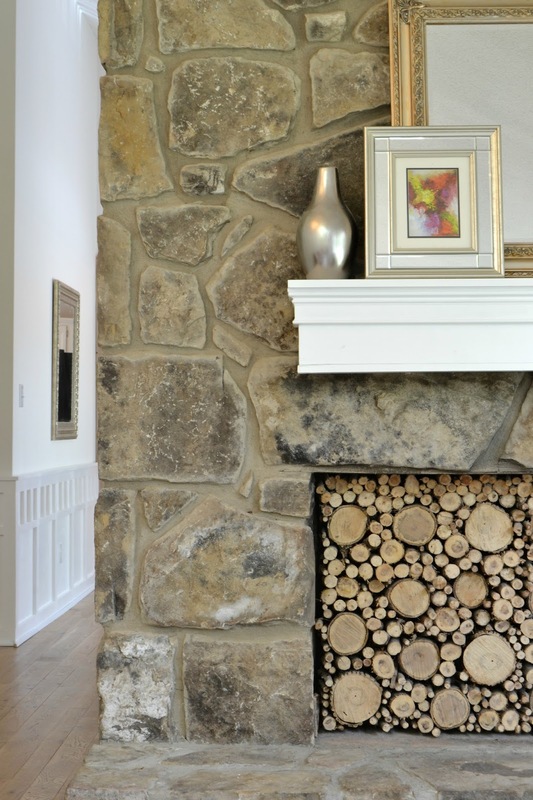 Spruce up an old fireplace with a faux stacked log insert. 6. 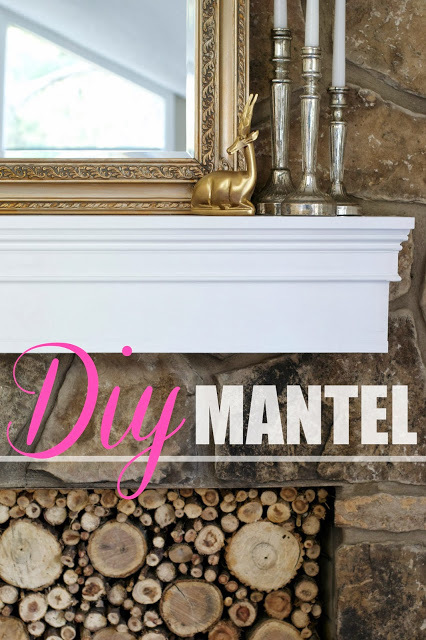 Or make your own mantle for less than $20 with some scrap wood and white paint. 7. 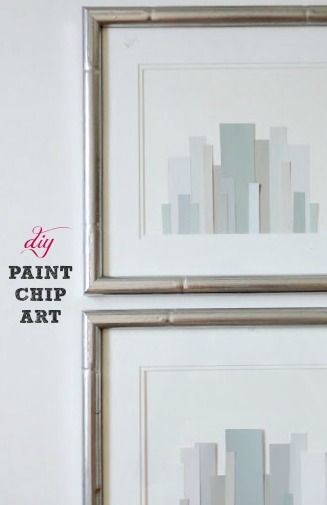 Buy some thrift store art and re-purpose it by spray painting the frame, painting the mat white, and adding some sequins. Go look at the before pic, and I promise you'll never look at thrift store art the same way ever again. 8. Search Craigslist and thrift stores for a cheap table and use it as an office desk. I found this table for $50, painted it black, and added a polyurethane top coat. It's served as my blogging headquarters since day one. I just re-assembled the office this week and it looks a lot different. Different layout, new paint, new rug, new light fixture, different wall art. Basically, the only thing that stayed the same is the desk. I'll show ya soon. 9. 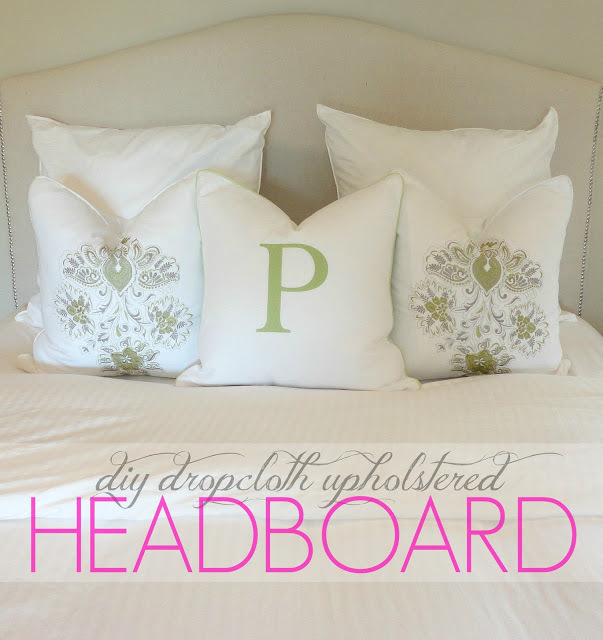 Build your own headboard. Because those things can be pricey. I made mine with a piece of plywood, upholstery foam, a drop cloth (used as the upholstery material), and some silver nailhead trim. In total, I think it cost me less than $50. 10. Find some cheap furniture and paint it a bold color. Painted furniture isn't for everyone, but if you're on a tight budget, you can can really do a lot with some cheap furniture and a little paint. Whether you're dealing with handmedowns, a thrift store find, or something you literally scooped up off the side of the road, paint can work miracles. I know we've talked about this dresser approximately 5,000 times, but he's such an icon that he literally just goes by his first name. *Vern asked me to say that. You know how he gets. 11. 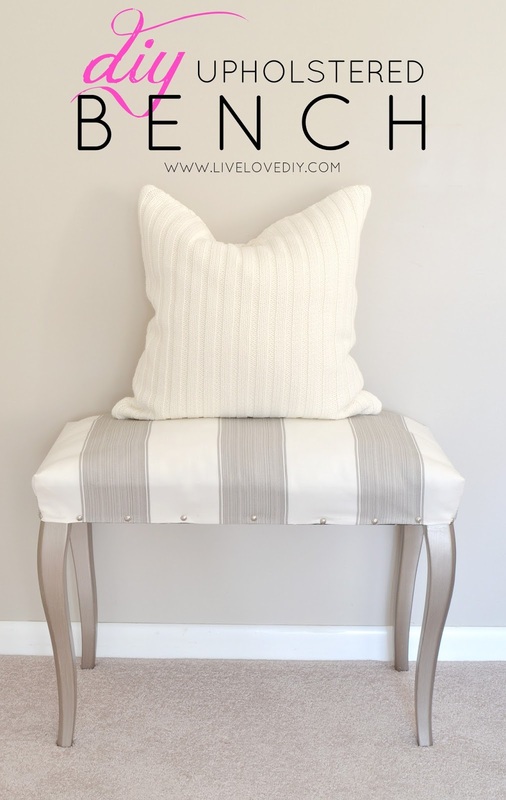 Reupholster an old piano bench and turn it into an upholstered bench for the foot of your bed. I just used some striped fabric, pillow stuffing, and nailhead trim, and then I painted the legs silver. 12. 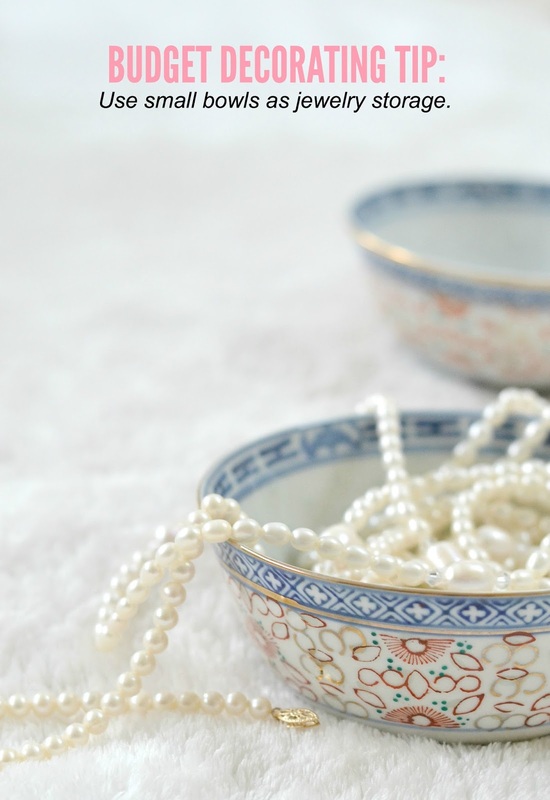 Rather than just mashing all of my jewelry in a sack somewhere (because, naturally...), I have a bunch of pretty little bowls that I've collected through the years (that I usually pick up for $1 or so while thrifting), and I store my jewelry in them. Vern's top drawer is devoted just to jewelry...all held in little bowls. I used to be the sort who would just leave her jewelry out in the open, but then I accepted Cheese and Tootie into my life, and that quickly went down the drain. 13. This is kinda similar to #12, but we're just gonna roll with it. 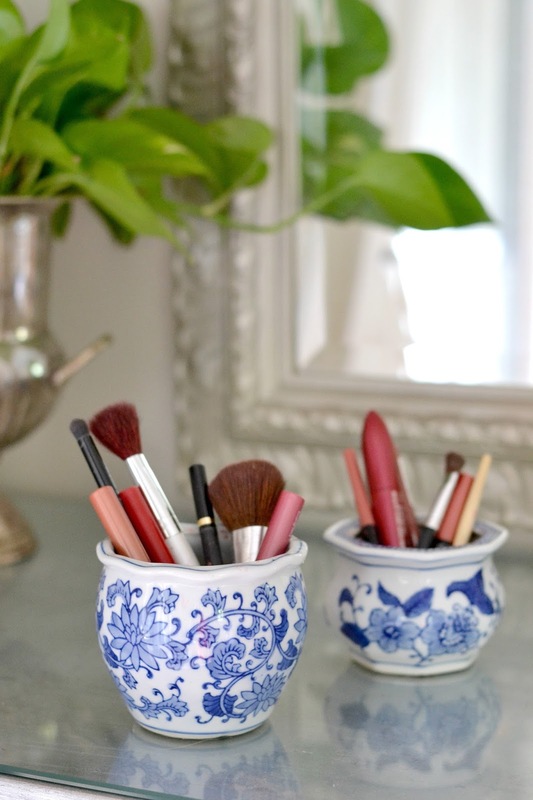 I also use small vases to store my makeup on top of my vanity table. Here's a closeup to save you from the squint. There's a plant taking up temporary residence on my vanity today. I'm trying to prevent plant murder by giving him some sun. Well, and water. I mostly just forgot to water him. Keep Herb in your thoughts. 14. And that brings us to the vanity. 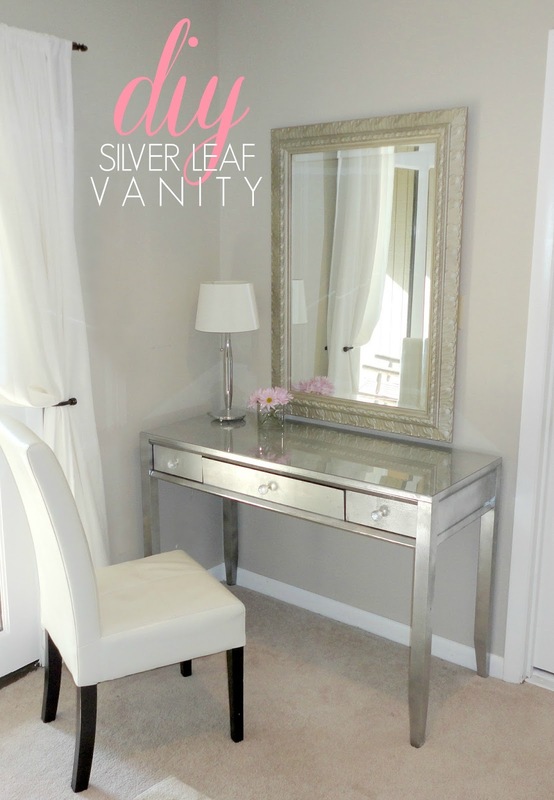 I know you guys love Vern, but the silver leafed vanity is my personal favorite. I sit here every day (because it takes quite a while to brush out my rat's nest) and although it's the the project that nearly killed me, it's one of the few things I've created that I'm just totally and utterly in love with. Plus, it was originally a $15 dark brown thrift store desk. So, that helps. 15. So, I have a pillow obsession, and there were a couple of years early on when I spent way too much money on pillows. I'll admit it. I can feel some of you nodding in shame alongside me. There's just something about a pillow, man. When you can't afford to get a new couch or redo your entire house, a $20 pillow gives you hope. I'm not saying it's healthy, I'm just being honest. But those things add up, and before you know it, you have a closet full of pillows that you aren't even using, and you wish you would have just saved your money and bought the new couch instead. Or invested in your cat's college fund. So, these days, I save my money and I make my own pillows. And the best part is that you don't have to be able to sew...you can just use fabric glue. 16. 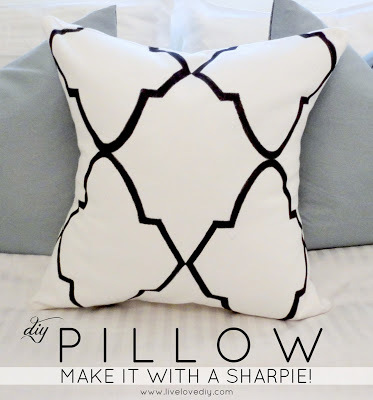 We've already said way too much about pillows, so we'll keep this one short: You can also make your own pillows by using basic white fabric, and then stenciling on your own pattern with a Sharpie. 17. Reupholstering thrift store chairs is a great way to save money, and I've probably salvaged more than 10 of them since the start of this blog. 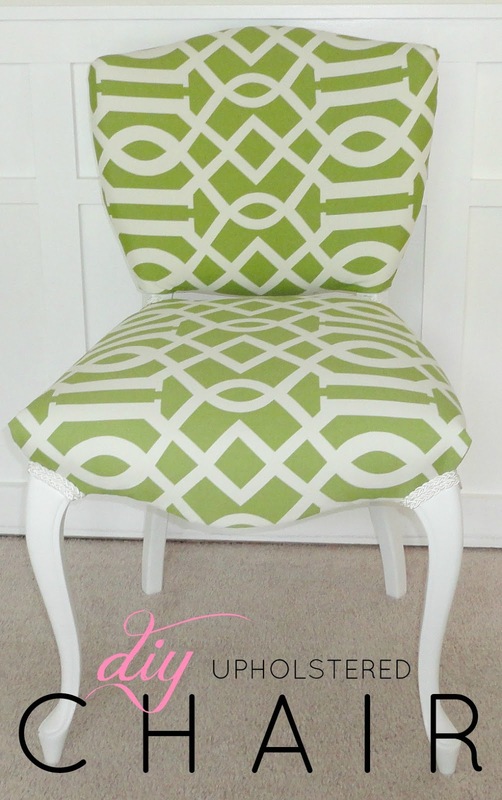 This green and white chair was one of my favorite redos, mostly because of how terrible it looked when I got it. All it needed was about a yard of fabric and a little paint for the legs. 18. Paint a thrift store dresser and use it as a TV console. You guys know how long I searched for this one, and the disaster that ensued when I tried to strip and stain it. But, nonetheless, I'm so happy with the way it finally turned out. Plus, let's be honest, the living room used to look like the below situation, so I appreciate the little things like an appropriately sized TV stand. 19. Mix metallics. I used to be so bad at this, but I've slowly worked my way up to being decent. And our house looks a lot better now that I've slightly improved my metal mixing skills. 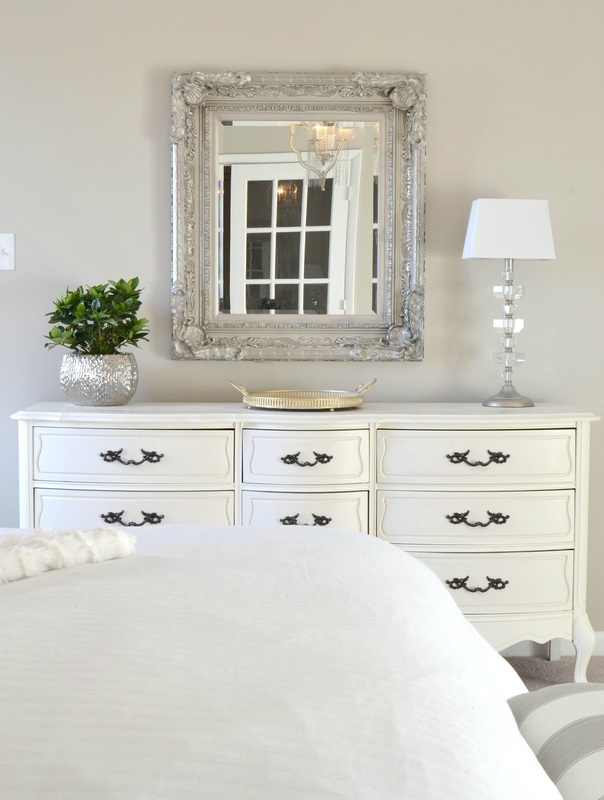 Lately, I use a lot of chrome and satin nickel, and occasionally add little bits of oil rubbed bronze (like the hardware on the dresser) and gold (like the mirrored tray I spray painted). 20. 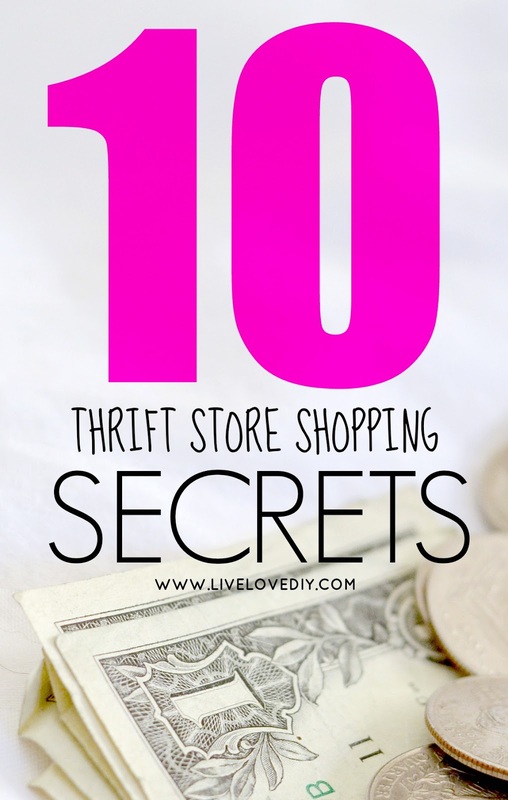 Shop at thrift stores. I still thrift a lot, and it's usually one of the first places I check when I'm looking for something specific. It takes a lot of effort, and you have to really train yourself how to see past what's there. But, once you get the hang of it, you can really find amazing stuff, and for so much cheaper than you would pay elsewhere. In the past 4 years, probably 50-70% of the stuff in our house has come from a thrift store. My general rule is to buy new when it matters: sofas, rugs, and bedding. And then the rest, attempt to thrift. If you've never read one of my thrift store posts, these two (here and here) will help you get started. 21. Our house had so much outdated cabinetry when we first moved in. Since we definitely couldn't afford to replace it, I decided to make the best of what I already had, and I painted it. I painted our kitchen cabinets and the vanities in both upstairs bathrooms, and it made a bigger impact on our house than almost anything I've done. Since the original tutorial, so many of you have asked me about how I painted the insides of the cabinets. And all I did was just use the same primer and paint, and coated it until you couldn't see the grossness that was there. It's held up pretty well through the years, and mostly it just looks so much better and makes me feel better about life. 22. Update the hardware on your kitchen and bathroom cabinetry (and even on your furniture if it needs it!). I've done this simple fix to every room in our house, and it makes such a big difference. I get almost all of my hardware online here and here. The prices are ridiculously cheap and the hardware is amazing. 23. Customize your kitchen cabinets by using chalkboard paint on the insides of the cabinet doors. My chalkboard phase has definitely passed, but I refuse to stop loving my little cabinets. 24. 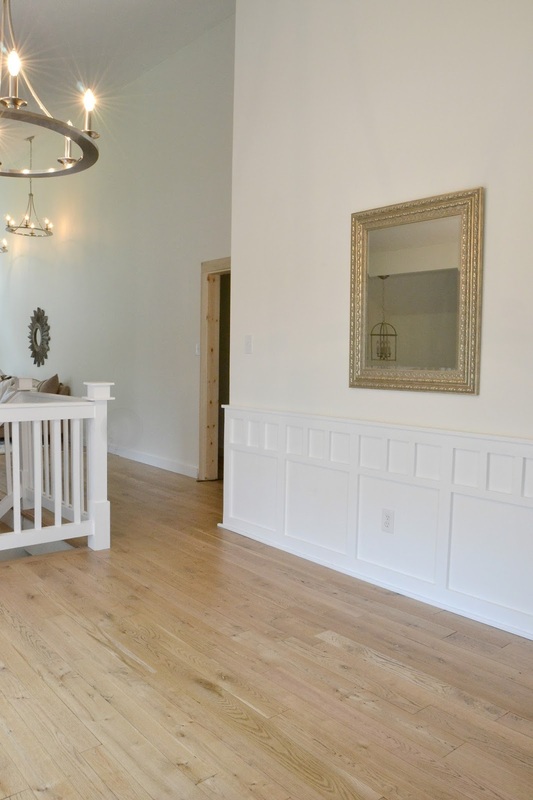 Add architectural detail by adding paneling on half of a wall. 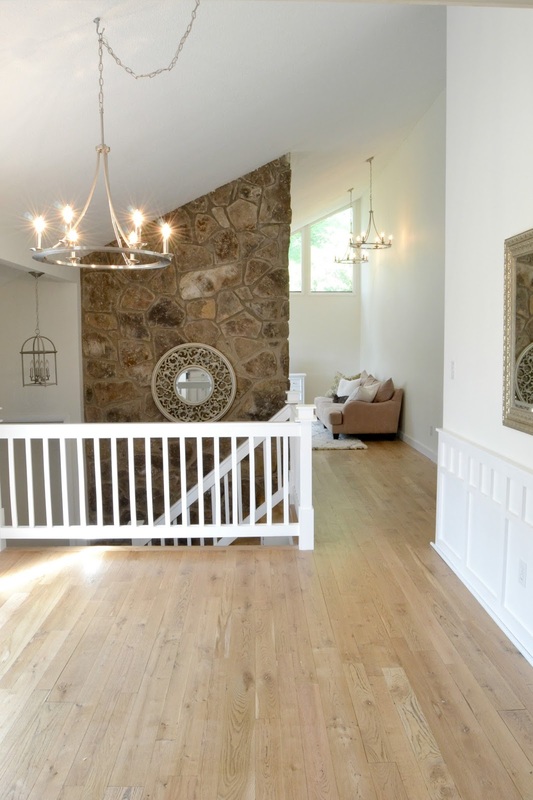 With molding you can give the illusion of added depth and dimension to the walls. The molding in our dining room was already there when we moved in (although it could be recreated with inexpensive MDF and just a few simple cuts), but it was a horrible orange wood. So, I caulked in between the seams, primed the wood, and painted it a semi-gloss white. And then last week (while I was in trim mode), I added some quarter-round trim to the bottom of the paneling near the ground. My eventual plan is to create a huge gallery wall above the paneling, but I want to figure out what the dining room is going to look like before I attempt it. I think I finally found the table, so ya'll, it's about to be ON. 25. Layer it up. When it comes to bedding, I like to layer all sorts of stuff. 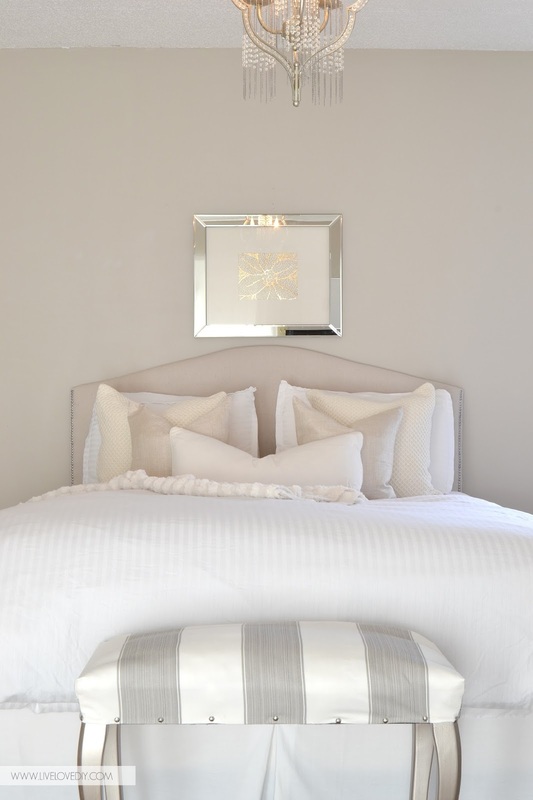 And since I mostly just do neutrals in our master bedroom, I like to add a bunch of different textures and patterns, like striped white bedding, sweater pillows, linen pillows, and a faux fur throw blanket. 28. 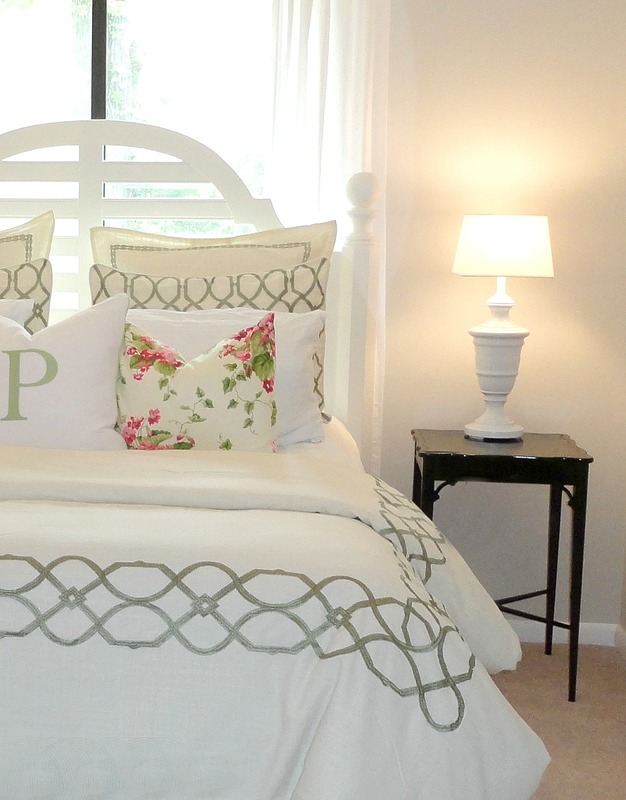 Another budget idea from our master bedroom: Frame a placemat above the bed like I did. One of my crazier ideas, but it worked. And 30. I found a $15 old wooden headboard and $30 bed frame separately on Craigslist. I assembled the bed and painted the headboard off-white. We just recently replaced it last month when I redid the guest bedroom, but it lasted for nearly 4 years and slept quite a few friends and family. 31. 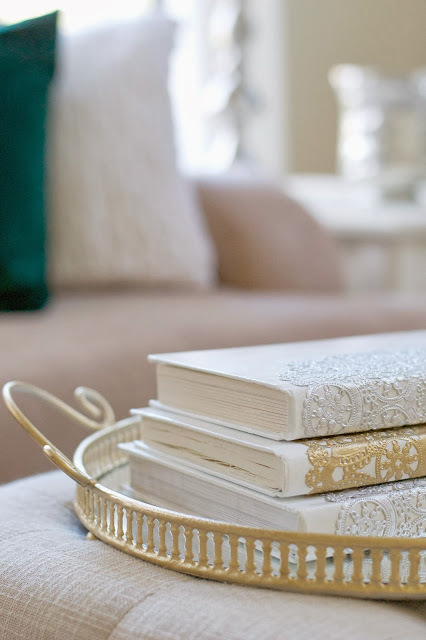 Give worn out old books a fresh new look with a coat of paint (and you can even add a metallic doily like I did to mine this past Christmas). 32. If you're a paint hoarder like me, you probably have at least one junk drawer filled with paint chips. So, make some art. 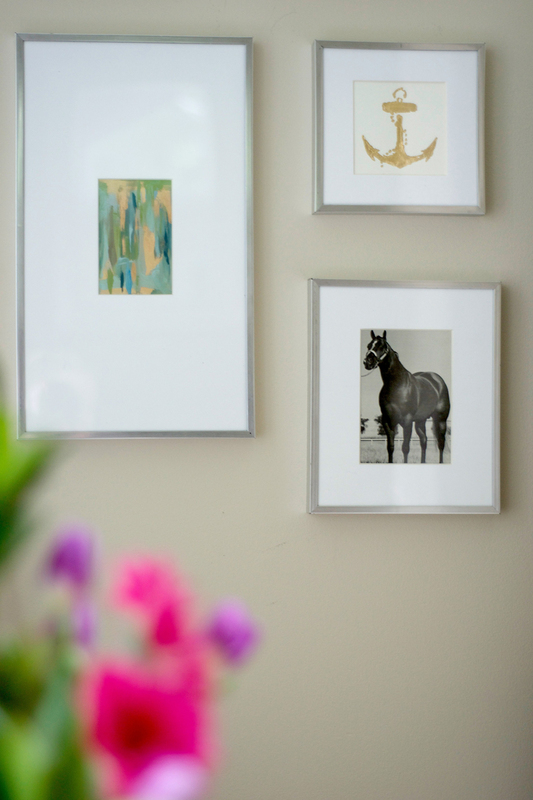 Those were also some thrifted frames that I spray painted silver and painted the mats white. 33. For the first version of our guest bedroom, I found antique botanical prints on eBay and framed them on both sides of the bed. You can usually find sets of 6 prints for under $10, and they make for great art. My photography was really special back in the day when I first started blogging, so feel free to appreciate this wondrous beauty. But, here's a closeup, nonetheless, in the hopes that it might at least give you a good cheap art idea. 36. Paint the inside of your front door. It's a pretty simple idea, but it makes all the difference. I painted ours with Sherwin Williams Urbane Bronze. 37. 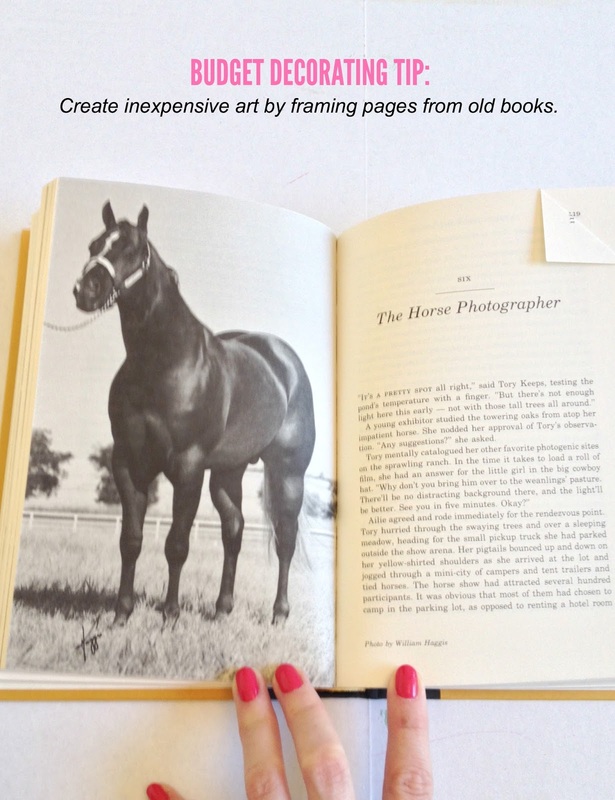 Another cheap art idea that I use all the time is to take pages from books and frame them. Thrift stores tend to have tons of books, and you can usually find at least one with something frame-worthy. And you can make just about anything look good if you put it in a frame with a mat. 38. 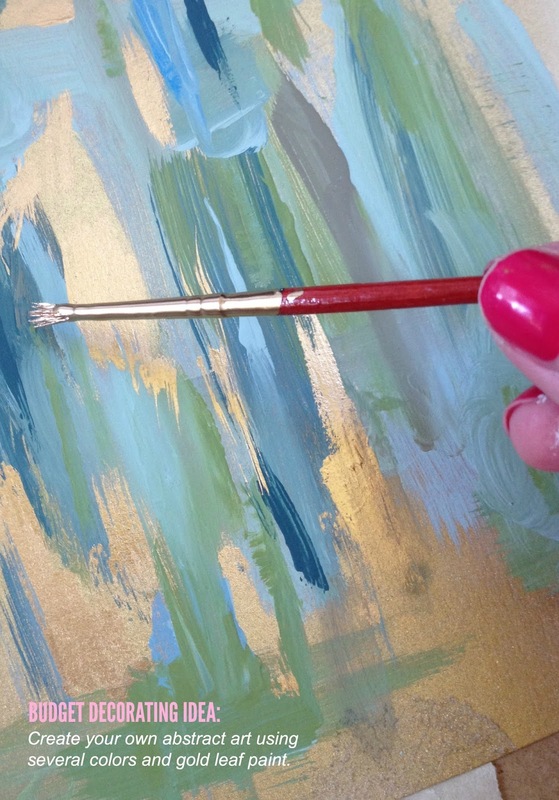 You can also make some easy gold leaf art by using the gold leaf paint like I used below. Or by using actual gold leaf like I used on this abstract art. 39. This next one requires a little imagination on your part. I made these two panels about two years ago, but they never made it onto the blog. So, although the pictures are slightly terrible, I think there's a good idea nugget in here somewhere. Basically, I cut a big piece of wood (that used to be our laundry room shelf, and which I actually eventually turned into this floral art) into two pieces and then spray painted them silver. Then, I used a giant stencil and rolled a little white paint over it. And it made for some pretty decent wall art, that probably could have been amazing had I styled it up right (rather than photographing it on my old orange hallway floor). I can't remember where I used these...maybe in the office for awhile, but I came across these pictures when searching for all my past project stuff, and just thought they might be worth sharing. Did you guys know that for every one project that makes it onto the blog, about five don't? Basically, I make a lot of crap that doesn't turn out very well, and then I hide it in a closet. So, don't feel bad if one of your projects turns out awful. That's normal and it's part of the process. 40. Did you know that you can buy furniture legs at Home Depot? Probably Lowe's, too. Anyways, I figured this out earlier last fall when I was trying to salvage Paul, the former TV stand. I threw away his first pair of legs (because they were in bad shape), and then I bought him a new set at Home Depot. Unfortunately, I kinda chose ugly ones, and then never painted them, and it just kinda made an ugly dresser uglier. You can buy legs!!! And although my first attempt at re-legging a dresser probably doesn't inspire you, I feel like idea itself just might. I mean, just look at all the little leg options. You could even paint them gold or make your own ottoman. 41. Make your own magnets using old jewelry. This one's simple, and who doesn't love simple? 42. 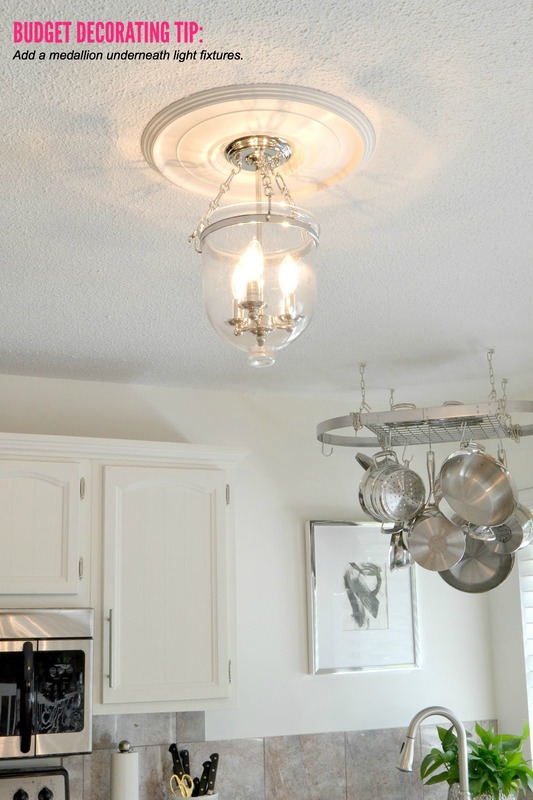 Add a little flair to your ceiling by adding a medallion. I found this one for only $15 at Lowe's. 43. 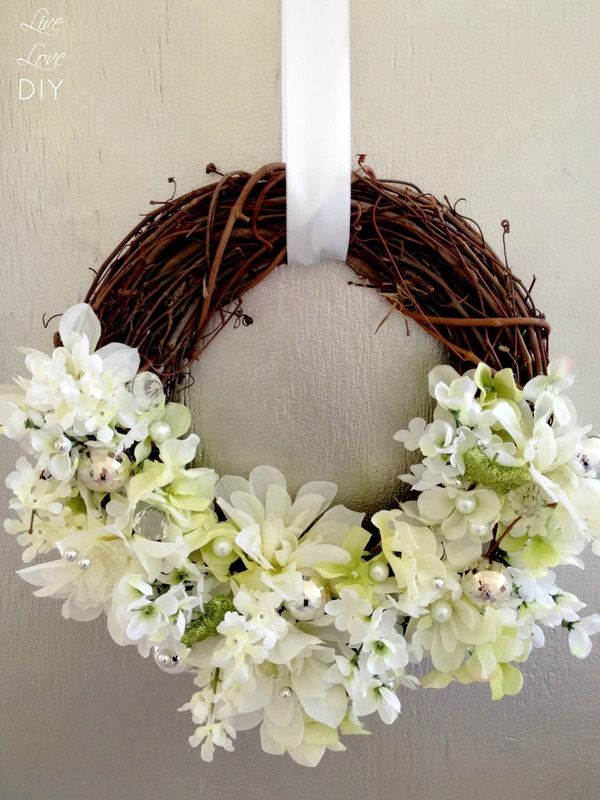 Add a wreath to your front door. I made my own with a few simple supplies from the dollar store. 44. 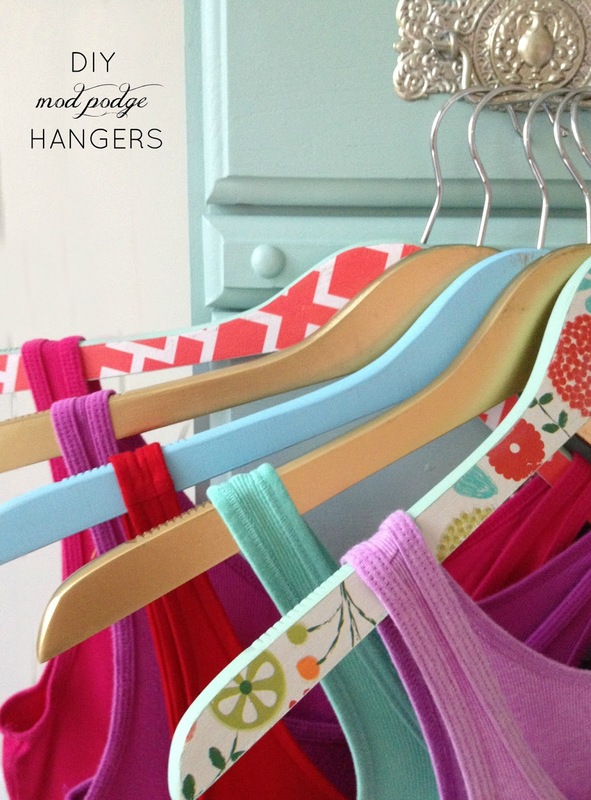 Make your old hangers new again by using gold spray paint, or add some pattern with decoupage and wrapping paper. 45. 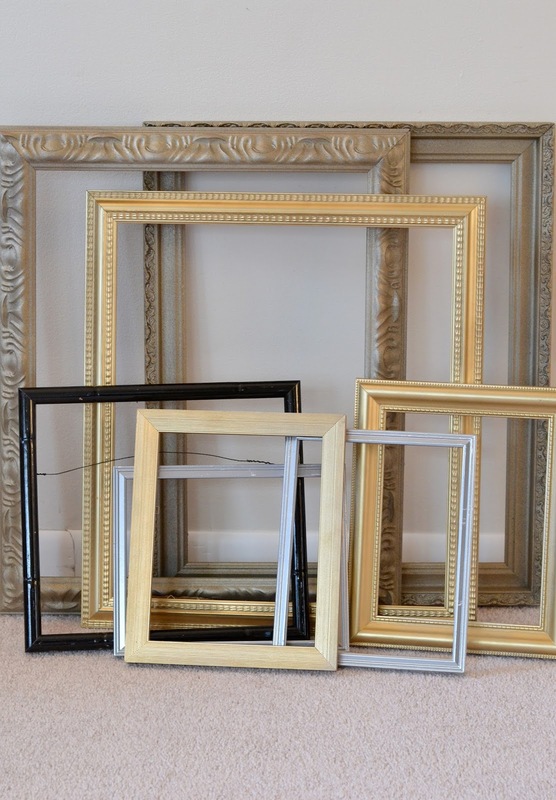 Save money by buying frames at thrift stores and spray painting them whatever color you want. You can even paint the mats, too. Although, through my own experience, I've learned it's best to paint the mats with flat white acrylic paint, as spray paint can sometimes stick to the glass when you reassemble your frame. 46. 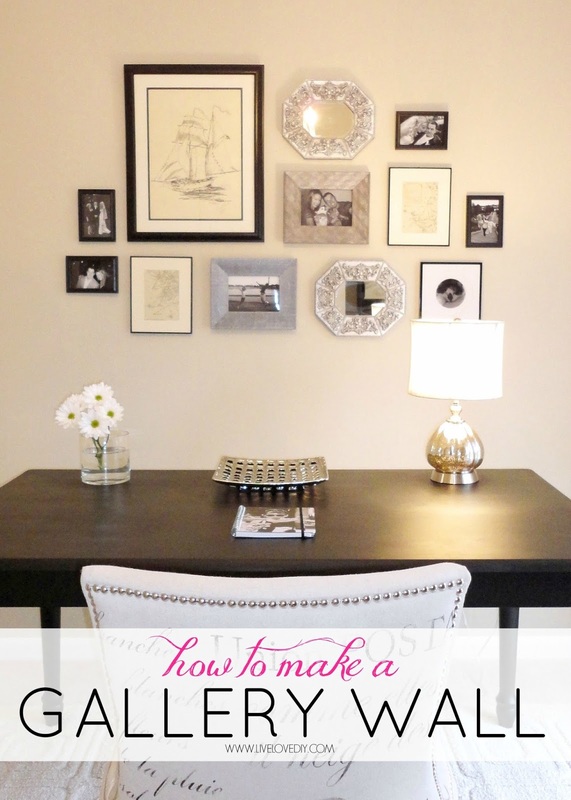 Make a gallery wall. It's truly an obsession of mine, and although we just patched a million holes and repainted the walls, I fear that this house is in imminent danger of me unleashing another round of gallery walls upon it. If you need some tips and ideas on how to make your own, these two posts (here and here) will get you started. Tell your walls I'm sorry. 47. 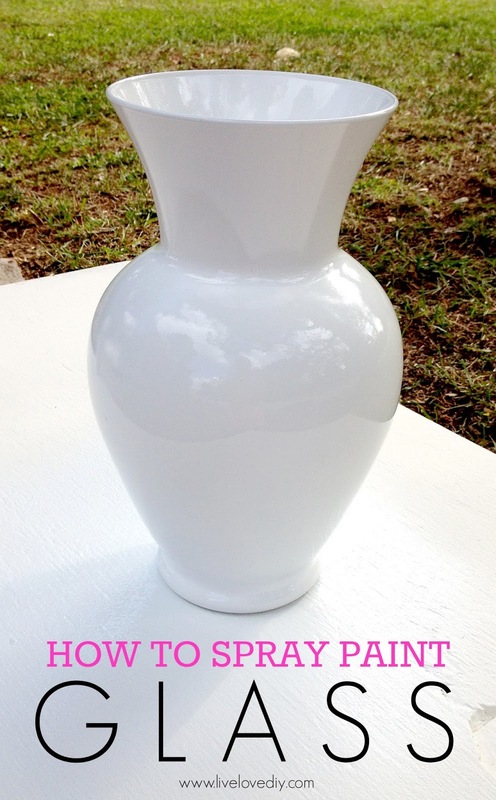 Change the color and look of almost any decorative object with spray paint. It's my favorite trick. 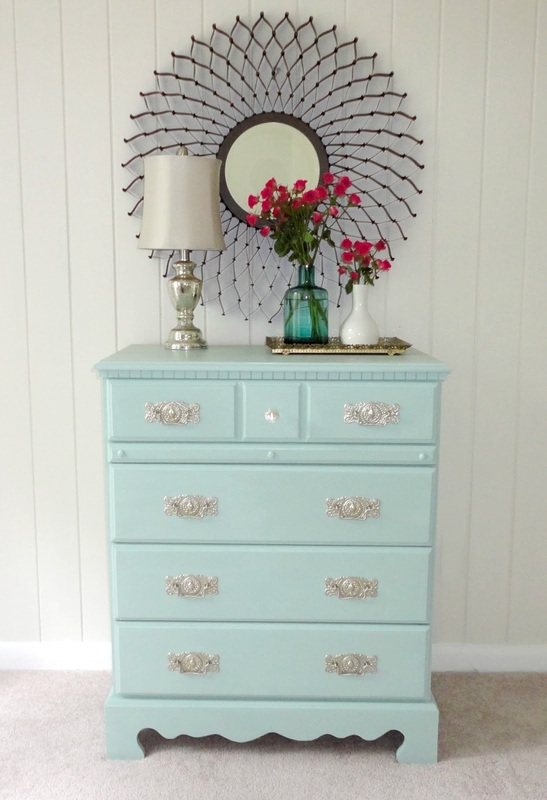 A few of my favorites are Rustoleum Bright Coat Gold and Chrome (pictured above). 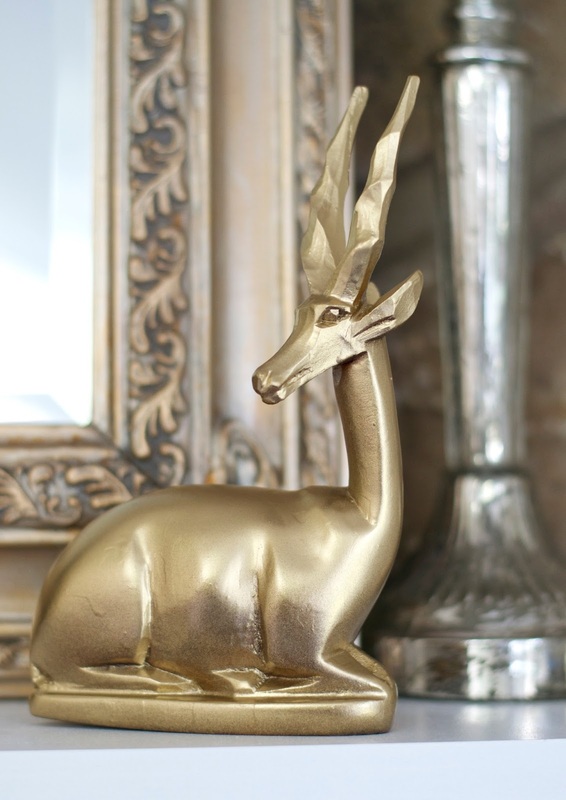 I used gold spray paint on the little wooden deer on the mantle that I found for $1. 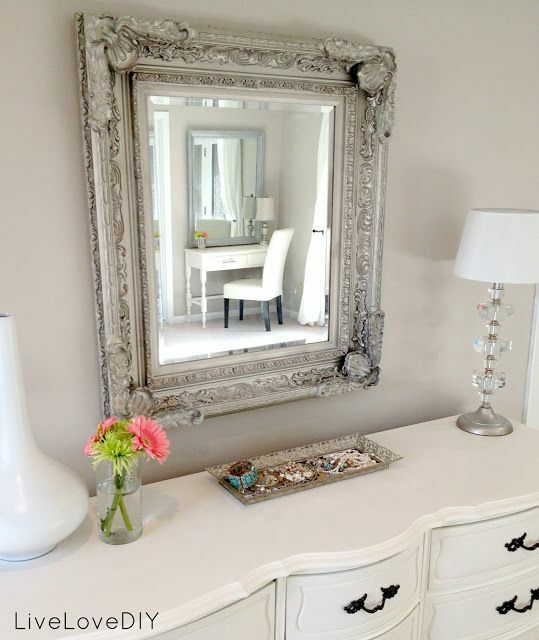 I also love Krylon Champagne Nouveau, and have used it on several mirror frames, like the one below. 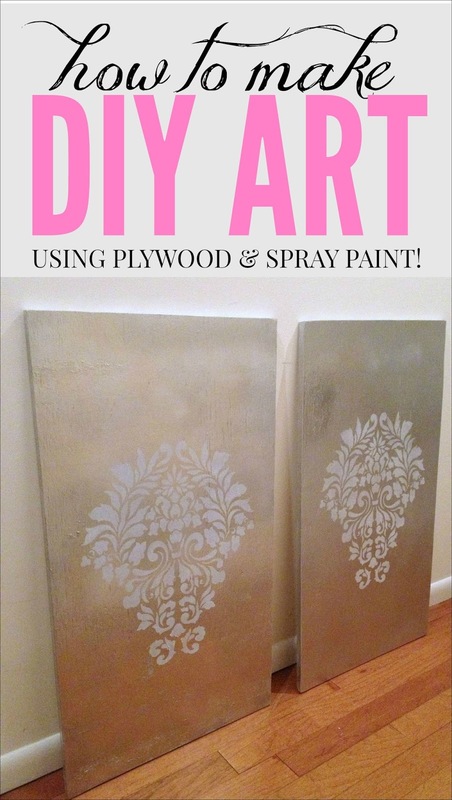 You can also use high gloss white spray paint on glass items to make them look like ceramic. I've done this so many times, and it works really well. Just don't wash it in the dishwasher, or the paint will come off. 48. Speaking of spray paint, a great way to save money is to buy lamps at thrift stores and spray paint them. 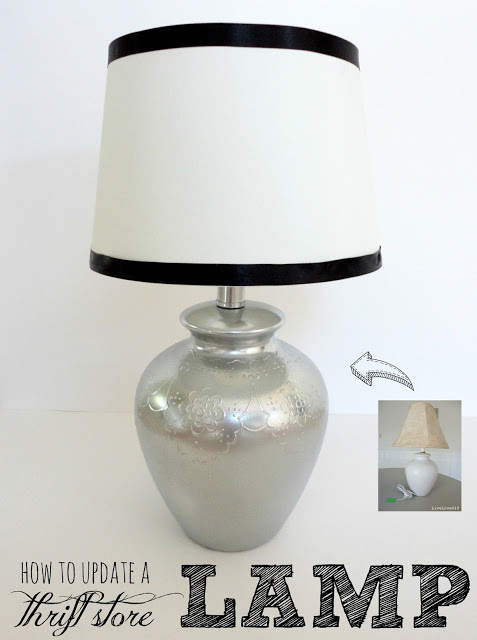 I used silver spray paint on the lamp below, and then customized the shade by adding a ribbon trim. 49. 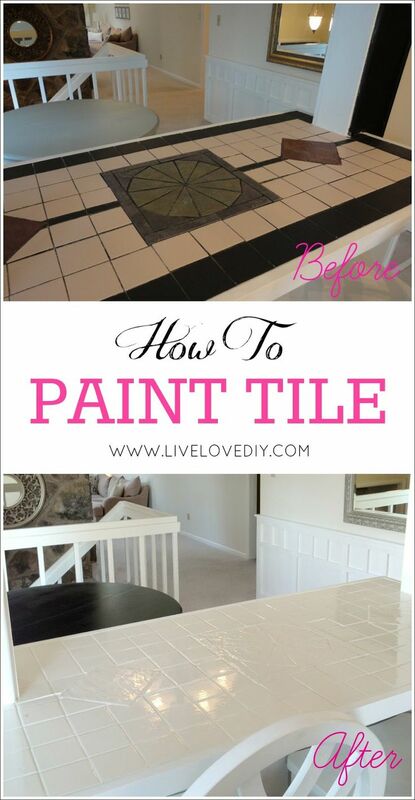 The ugly tile that was on this little bar countertop drove me crazy for almost a year before I finally got the guts to paint it with some specialty tile paint. Although we knocked down this entire wall a few months back during the renovation, it's still one of my favorite projects because painting the tile made me so much happier with our house in the meantime. Plus, you get to dress up like Walter White when you do it. Bonus. 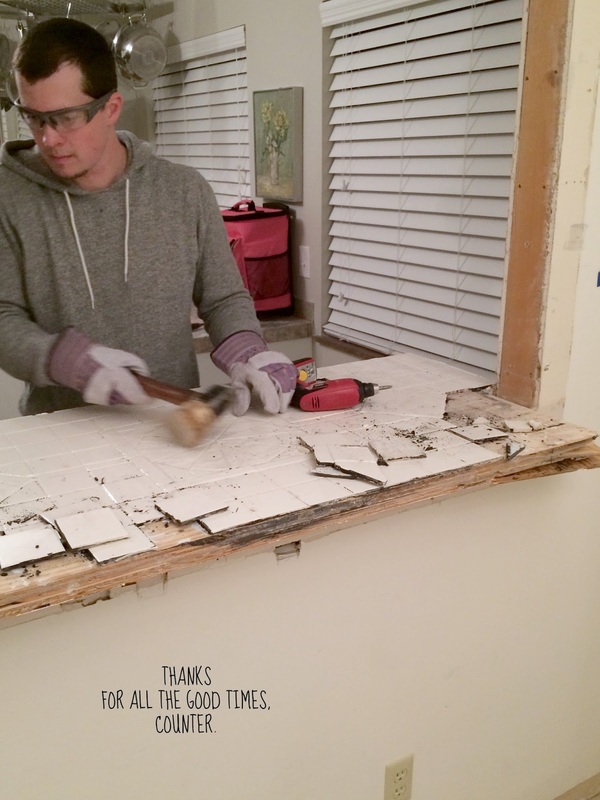 The tile paint stayed intact until the day we knocked down the wall. I mean, Jesse literally took a hammer to it, and the tile paint never chipped. 50. I'll save one of my favorites for last, because it helped to put this little ol' blog on the map two years ago....painting stripes on the wall. I remember painting these stripes late one weekend night and feeling like I was crazy to be spending so much time on a house. Two years later, the stripes craze has kinda died down, but this bathroom helped me build a blog that's truly changed my life. And for that, it deserves to be my fave. We're planning to redo this bathroom sometime later this year. For now, I'm planning a new vanity and new flooring, so maybe the stripes will stay, or maybe I'll get a wild hair and try something new. I'll let you know when I figure it out. Before I go, I just want to thank you guys for sticking with me while I push through the last part of this renovation. It's been the hardest part, and I'm kinda feeling like a squashed slug, but the exciting stuff is on the horizon. I can feel it. That's all for today! 'Til next time! Holy decorating moo-cows.You're definitley not a good decorator... you're a FABULOUS decorator, girl! Thanks for sharing!! :-) Awesome post. My fiance and I just bought a new (old house) that was built in 1956. We signed and got the keys yesterday. (Yay!!!!) 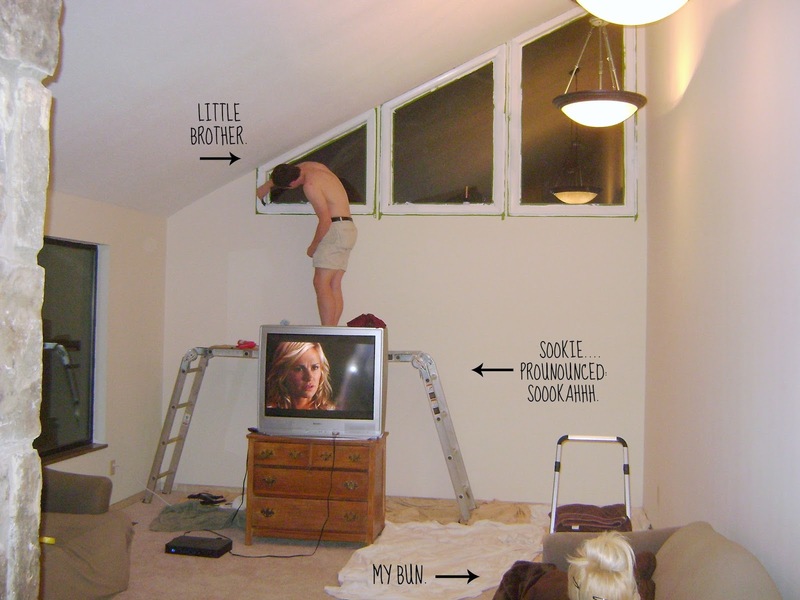 I have never lived in a house before, let alone had a single thought about a home renovation project. I have been going through your blog the last few days and I am feeling inspired!!! 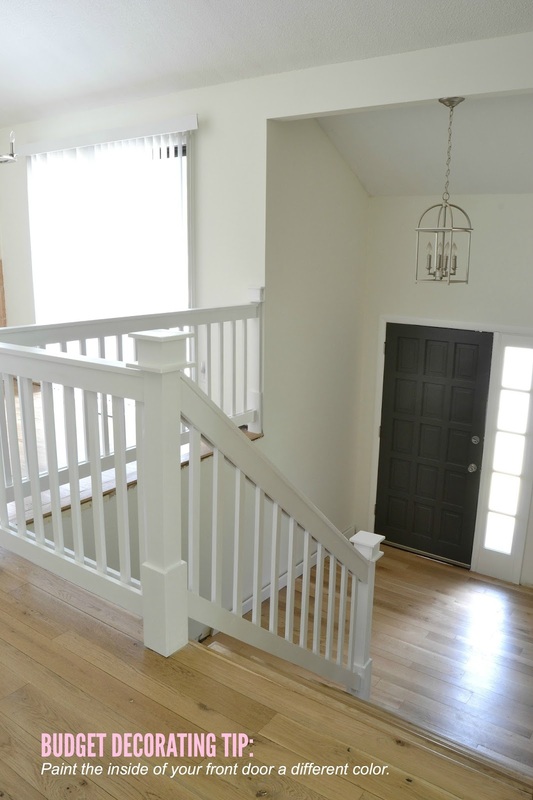 Seeing your home renovation reassures me that with a little patience and creativity, we will he able to make our home something great! Thanks for this post suming up some of your greatest projects! I cannot wait to get started after we get moved in. 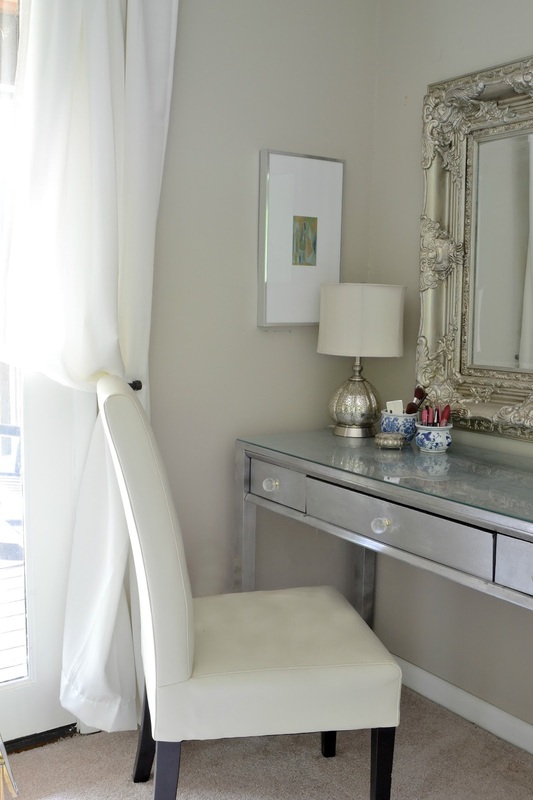 I am thinking my first project will be something similar to your silverleafed vanity! Congratulations Vanessa!! That's so exciting!! I just want to say a great, big, massive THANKS to you! I just recently found your blog and it is ahhhmazing. You inspired me to give it a try and paint our hideous pinewood-color dining room table, an IKEA tv-stand and a coffee table from awful kill-all-the-light-in-the-tiny-living-slash-dining-room-dark to gorgeous white. It turned out better than I expected. I love your way of writing! Ps. You can never use too many bombastic adjectives, can you? Especially no. 50. 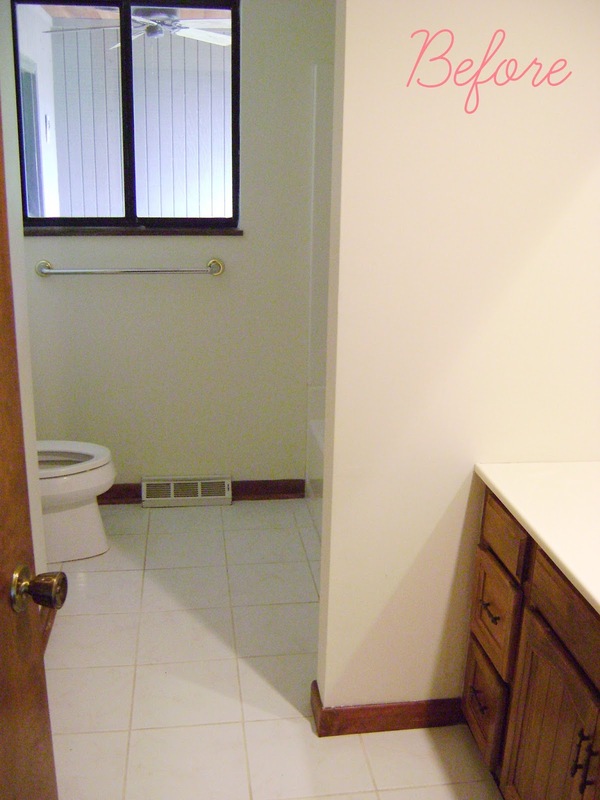 It looks like a totally different bathroom. I love all your ideas soooooo much! Im working up the courage (and motivation lol) to actually try several of these out at my own house! Thank you for your easy directions :) Also, random--but what color are your bathroom countertops? I swear I have the exact same vanity in my bathrooms and I hate it because it looks pretty dated. I wanted to paint the cabinetry white, but was afraid that the off-white counter may look ridiculous with it lol. But if yours is off-white too, it totally looks great and I may go for it! I love this so much perfect! 1. I love your office chair! 2. One of the best things I ever did was buy a $20 dresser from a local website similar to Craigslist, paint it off white, and replace the handles. I often get distracted by it's beauty as I'm watching TV. It completely changed my living room. I recently decided to change the handles and sprayed them Kryon Caramel Latte (a color I think you would like, BTW), and for $0 and about an hour of work, it's like brand new again. So to #18 I say a resounding amen! 3. #40 - I bought some legs at Lowes and added them to a bookshelf. Such a simple update, but it makes it look so much better than the cheap shelf I bought in high school for about $20. There's just something about a piece of furniture sitting on legs instead of directly on the floor. I love your blog and all your thrifty inspiration. Can't wait to see more updates on your house! 1. Thank you! It's the comfiest thing I own....makes for a good blogging spot. 3. Awesome again...what a great idea! Everytime I stop by this blog, I literally spend hours. Thank you for this post. I will totally try the pillows. You have great style, thank you for the tips. There's so much to love in this post. I think it'll make a perfect coffee table book (hint hint)... Great job on all of them..
You own me!! And you DOUBLE OWNED ME when you made the Walter White comment. So I have a question that may not have an answer: I inherited some very nice/expensive dressers (low boys are the exact term, I believe!) from my dad when he died. They're great. Except they're not my style. At all. And they definitely don't match the room they're in (or any other room in my house). Do you have any suggestions for what to do in this situation? I can't bring myself to refinish them, but I can't really come to grips with getting rid of them either... So basically there's no solution, right?? I'm so inspired to translate some of these projects to my apartment now! Maybe no painting for me, but your artwork and decorating ideas are gorgeous! I love how you take cheap things and make them look so expensive and luxurious -- so much white and metallic! Love it. I discovered your blog not long ago, and I want to say thanks for sharing ideas that really are cheap. 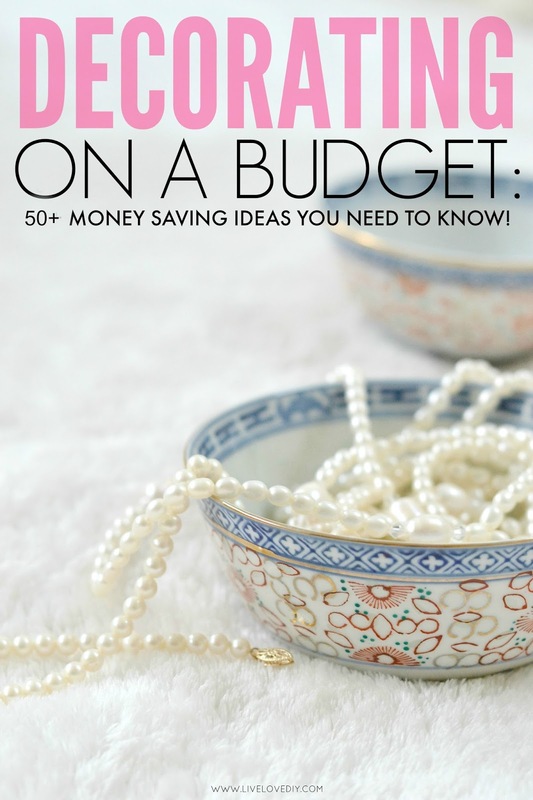 So many "decorating on a budget" sites make me wonder, "WHO'S budget is that, exactly?!" Not mine! I am living in a rented house, so it doesn't make much sense to spend money on decorating. But thanks to your tips I've been able to spruce up a lot of my rooms for cheap. Your house is looking fab. Enjoy your witty and humorous style of writing, keeps it real! 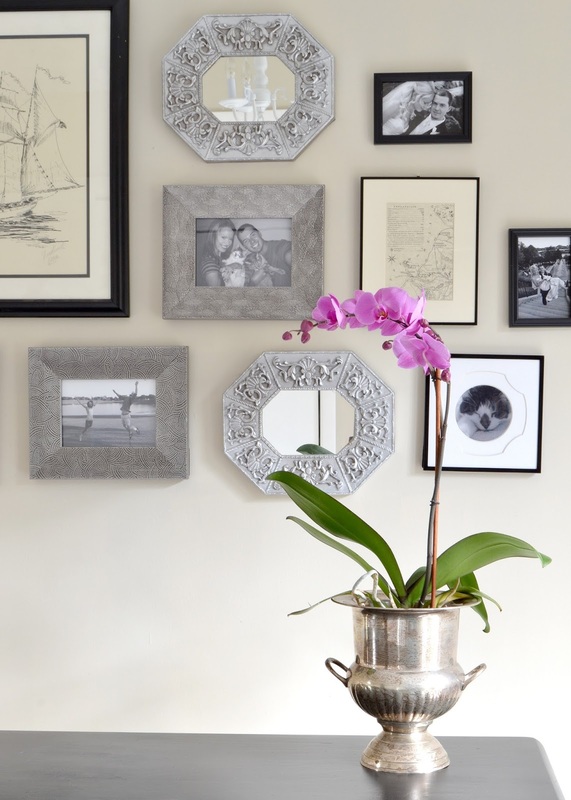 About your gallery wall. I just recently redecorated my master bedroom, really wanted to do a gallery wall, but like you I didn't want to put a bunch of holes in my newly patched and painted walls. 3M sells these neat velcro picture hangers that you stick on the back of the frame, peel the tape, and then stick it to the wall. Mine has been up for about five months and I haven't had a single picture fall yet! LOVE this post! Just stumbled upon your blog and I am definitely a HUGE new fan!!! The ideas are so unique and super cute! I have a question for ya. I also love the colors that you chose for your walls inside your home. Do you happen to know the name and brands of those colors? Would you be okay if I copied you!?!? I am moving into a new home now and choosing colors that jive together has been frustrating me to no end! If you're fine with sharing, you'd be doing me a huge favor!!! Thanks Virginia! These are such great tips! I'm a fairly new reader of your blog and I am in love! I just started my own blog, and yours has given me so much inspiration. 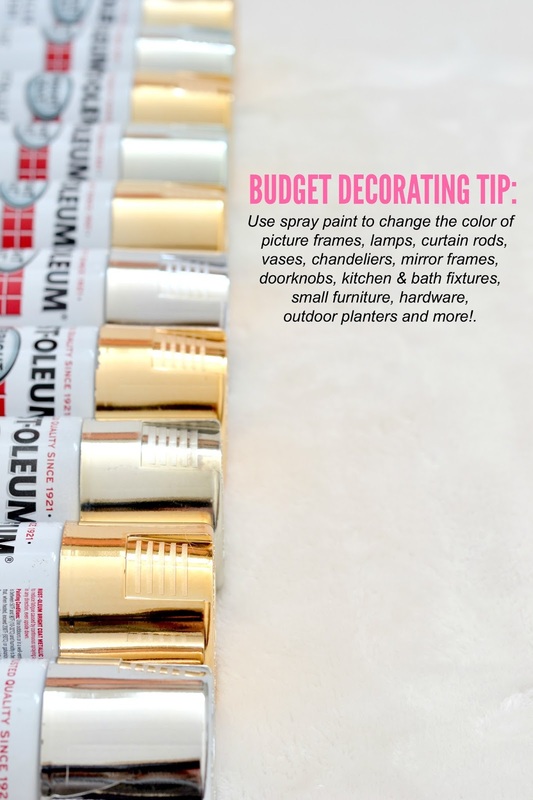 We're actually pretty similar in our decorating styles... Also, I use pretty much all of the same spray paint colors as you do (except Rustoleum Universal, I'm cheap...) Thanks a bunch for the fabulous ideas! Aw, I love that! Thanks so much, Cassandra! Really enjoyed reading your blog. Maybe you'll have a brainstorm about a decorating dilemma I have: an old medicine cabinet and light in my bathroom. Of course, I'd like to re-do the bathroom entirely, but can't afford to right now. But I'd really like to jazz up the medicine cabinet and light. I've seen ideas that use frames for old mirrors on Pinterest... but not when they were a medicine cabinet and the resulting depth that needs to be taken care of. I'd send you a picture but not sure how to do that here. Any ideas you have would be appreciated. Loved all these ideas! Just followed by email! Thanks VA! Wow! Amazing that all of those project are yours!!! You didn't just collect them off of Pinterest to make a collection. You are an amazing DIYer and very fun author! Hello .. I just have to tell you. I laugh when people say, I love (blank..... i.e. my car, my new rug, etc...). But for the first time ever I have fallen in love with someone and something I am not related too. I love your blog, you make me smile so much. There, I said it. You have inspired me so much, beyond ever a word could be used to explain. I was an interior designer using thrift store items and making them new. Then when I moved to Norway, I redid our brand new built house, and the Norwegians were like............... well, you know, they had that deer in headlights look, or more..........what the hell is this woman doing? LOL. But 6 years on, and Norway is finally coming around to great decorating ideas that bring modernization to a land that before would never dream of a full refrigerator! (can explain but won't... ;) ) Anyways, we moved out of our brand new home, (too plain for me) and bought an old cabin right on the sea at the bottom of a mountain. Now, to be inspired. 4 years on and I just painted finally my living room walls a very pale grey for backdrop. Now I know what I must do and where to begin. THANK YOU for being you. You are funny, creative and so very talented and I want to be along for the rest of your journey as you discover and do more with your home. 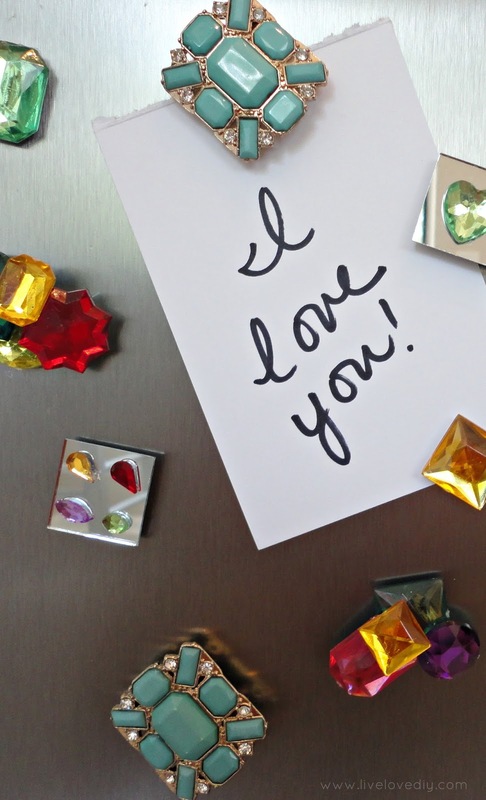 I love ..... (you) simply put! From one woman to another who wants that expensive look but takes pride in doing it DIY on the cheap. Loved the ideas and your easy-reading way of writing. Definitely bookmarked your blog! Okay. Your unbelievable. This is so so amazing. I love every project of yours and honestly I could not believe one superlady managed to do all this. I envy your patience and incredible sense of style. Thank you for these amazing stuff. I will try every single one of them. Probably. I love your blog! It inspired me to start my own blog! Just found your website and so excited about it!!! Can't wait to use your tips in the future. This is gonna keep me busy all spring and summer! :) Awesome ideas! Thanks for sharing! I recently found your blog and I love it. This was an awesome post. Can't wait for the reveal of the house. Your blog is right smack in the middle of my niche. Thank you. :) I look forward to learning from you as I grow my following. Behind The Scenes: Petting Zoo.